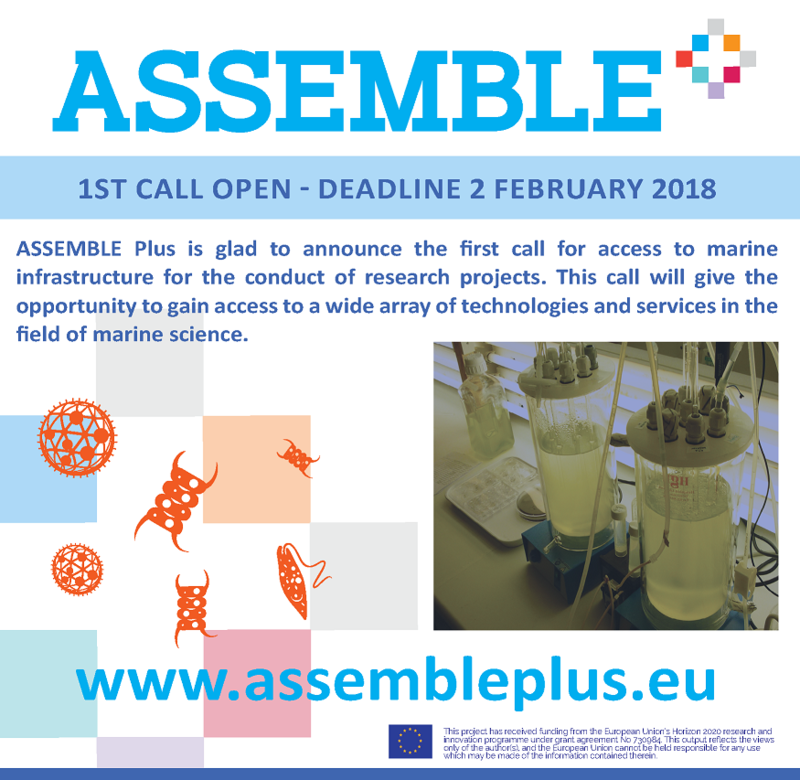 ASSEMBLE Plus are glad to announce their first call for access to marine infrastructure for the conduct of research projects (not simply for training, workshops or outreach activities). This call will give the opportunity to gain access to a wide array of technologies and services in the fields of marine science. Culture collections and biobanks for microalgae, cyanobacteria, protists, bacteria, seaweeds, viruses, zooplankton, invertebrates, fish. Sampling facilities, which include research vessels for coastal sampling, sampling equipment, SCUBA diving, and remotely operated vehicles. Isolation and preservation of marine organisms, which includes strain isolation and purification, optimization of cultivation / fermentation / preservation conditions, revitalisation of cryopreserved and lyophilised material. Cultivation and rearing facilities, comprising aquaria, incubators, climate rooms, photo-bioreactors, tank facilities. Microscopy and bio-imaging services, which include fluorescence microscopy, TEM and SEM imaging, confocal microscopy, flow cytometry, micro-CT and bio-imaging. Taxonomic services, which include morphological and molecular identification, phylogenetic analysis, barcoding, mass spectrometry for identification MALDI-TOF. Molecular biology and –omics, which comprises sequencing, genotyping, qPCR, Next Generation Sequencing, bioinformatics analysis. Biochemical analysis, including protein structure, protein interaction, recombinant protein expression. Bioassays, which includes phenotypic assays, protein assays, (anti-)microbial assays, quality control of raw materials and products, verification of microorganisms associated with novel products. Structural and chemical analysis, which comprises HPLC, mass spectrometry, pre-metabolomic screening, metabolomics profiling, structural elucidation.